Marcus was convinced that vampires didn’t exist. He was very wrong . . .
On his thirteenth birthday, Marcus Howlett is faced with a bombshell. His parents are half-vampire. And, although he hates the thought of it, he is about to become one too. 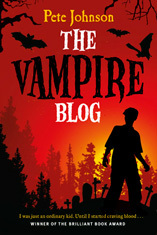 But, as he secretly blogs about the horrors of his new fangs, bad breath and cravings for blood, Marcus is unaware that his life is in serious danger . . . Categories: Horror | Tags: Pete Johnson | Permalink.